Last week we got back from a three week trip to Mexico and it has taken me 10 days to put together a “Trip Report” – it was just all a bit overwhelming. I have travelled the world and have been to many countries inspecting equestrian trips, but seldom have I experienced such a variety of landscapes and cultures as on this trip. 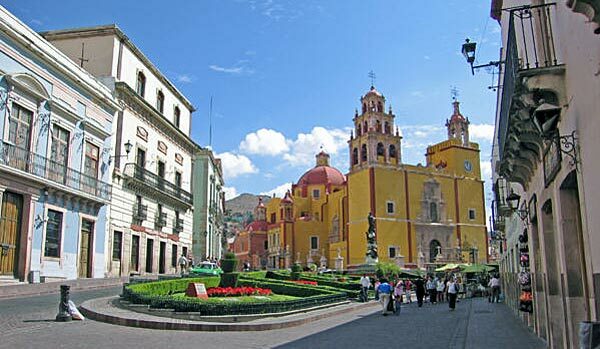 We visited the Mexican states of Jalisco, Guanajuato, Hidalgo, Mexico DF and Chiapas. The catalyst for the trip was the “Adventure Tourism Summit” in Chiapas and it turned out to be one of our best trips yet. We came home with two brand new trips that will be an excellent addition to our existing programs and of course we visited with our friends and partners of the existing rides. From Vancouver we flew to Leon via Houston (from Houston it is just a 2 hr flight). Leon is a busy city and one of the main gateways to central Mexico. 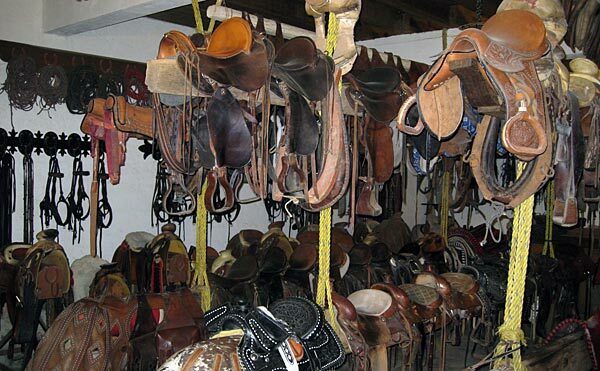 It is well known worldwide for its factories that produce leather goods … so if you are thinking about buying shoes, leather pants or any kind of horse gear … plan on an extra day in Leon .. it may just pay for your trip. With its big malls, Office Depot, Wallmart, etc … Leon could easily be in southern California (I was impressed by the well maintained main road system). In one of the malls I bought SIM cards for my iPad and Samsung Tablet and off we went (great internet access almost anywhere we went .. no roaming charges throughout Mexico). First stop was Hacienda Sepulveda, part of our “Five Haciendas” ride. 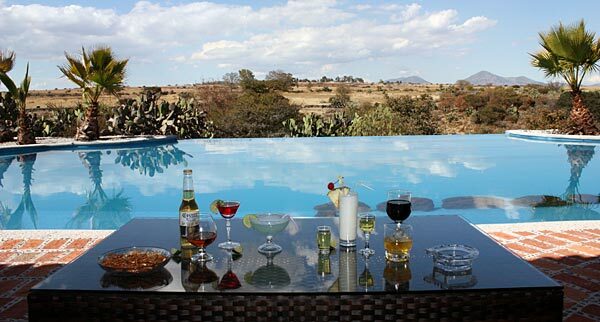 It is a historic hacienda turned into a Boutique Hotel, without losing its flair and charm. Wonderful rooms, great facilities with a very romantic pool and good cuisine. We even tried some “real” Tequila from the region … and I can assure you .. it is not a Tequila you have ever experienced. I had no idea that there is a real ‘Art’ to Tequila production … I guess they only export the cheap stuff. 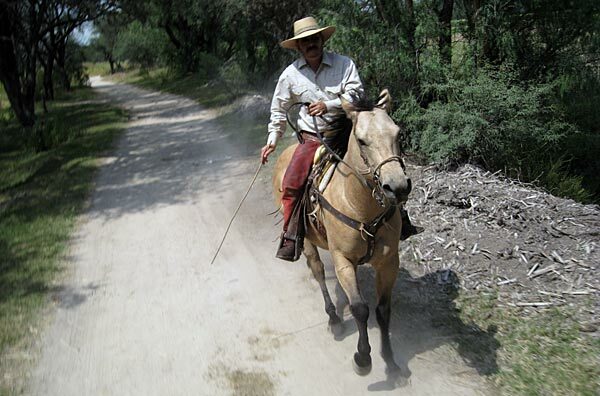 The rides were great fun through farm fields and to other historic haciendas that demonstrated to us true “Chargas” (cowboy) traditions. Mexico has an amazing horse culture and fantastic horses ! Mexico can really keep up with the best in the world. One thing I realized was that Sepulveda is so much superior to the other haciendas on the Five Haciendas Ride, that we decided to change the lodgings to be at this place for the whole week and just ride on the other haciendas … I think it will make for a much better riding holiday … relax at wonderful facilities during the week and enjoy great rides across five different haciendas during the day. Next we were picked up by our new friend and partner, Angel, and we inspected and explored a new route that I believe will be an excellent luxurious progressive ride for our clients. The ride will go over mountain passes, across hacienda estates and faster paced travels on horseback over wide open plains. 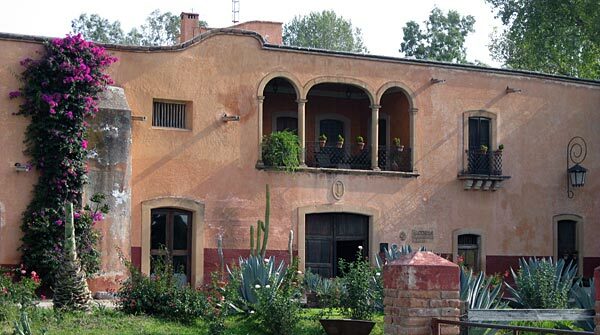 Overnights will be in Unesco Heritage Towns (Guanajuato and San Miguel de Allende), at historic Colonial Haciendas and a Boutique hotel with delicious cuisine. I cannot even start to properly describe these places … you really have to see to believe it. 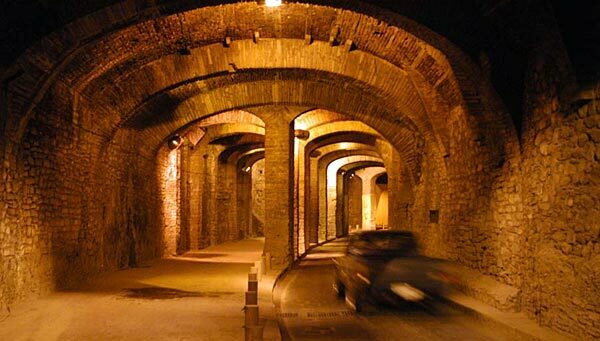 Guanajuato alone would be worth visiting for a week … it is an amazing historic town with underground “Tunnel Roads” that can get confusing if you do not know your way around … these are not tunnels from the last few decades .. they were all started centuries ago when this was a mining town. The center is just lovely with a park like place that provides entertainment and is a social meeting point for the locals and the tourists. Bands play, children are laughing and people in general are having a great time. The same can be said for the maybe better known San Miguel de Allende …. romantic, artsy, cultural and just places to “feel good”. I can’t wait until we got the whole trip organized and ready to go ! Then we drove across country (on very good roads) for 3+ hours to Toluca, where our friends and partners Pepe and Lucia picked us up to drive to Valle de Bravo and Finca Enyhe. If you have followed our trips over the last 12 years, I am sure you are already familiar with our top of the line “Classic Cavalcade”. It always was and still is one of the best equestrian vacations anywhere. From the horses, accommodations, meals, guides, hosts and the immense variety of the landscapes – it is all first class. The millions of butterflies (the Monarchs) that winter here from November to March are just an added spectacular bonus to see, to an already unsurpassed trip. Our visit here was not to inspect, but to visit with our friends. It is always good to see Pepe and Lucia and their daughter Georgina. We spend a few wonderful days at Finca Enyhe and Valle de Bravo, which has developed into a small “boutique” type vacation destination for the well to do Mexican population of Mexico City. They are just starting to see a few foreign tourists here and most of them are on our riding tours with our friends. 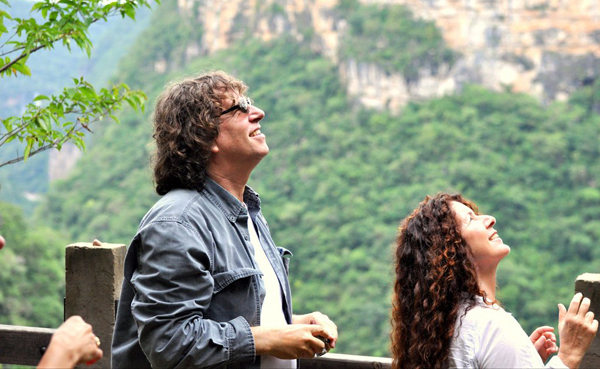 We were fortunate to spend some additional time with our friends at our next destination …. 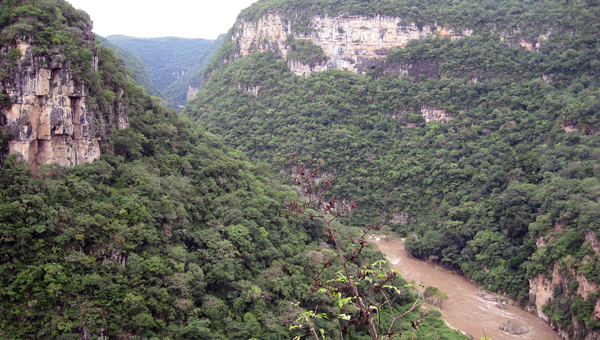 Chiapas, since also they were invited to the World Tourism Summit. From Valle de Bravo we transferred to Mexico City to catch a short flight to Tuxtla in the southern state of Chiapas, which at one time was part of Guatemala for about 20 years - just after the 1910 revolution and war of independence from Spain. As already mentioned we were to attend the World Adventure Tourism Summit in San Cristobal de las Casas, but first we spent a few days on a pre-summit horseback riding trip that inspired me so much that immediately I decided to make it one of our next new riding destinations in Mexico. I am sure by now you have figured out that I am a bit Mexico fan, but the experience in Chiapas surpassed even my best expectations.After a nice dinner and overnight at the … Hotel in Tuxtla, we were met by Gloria and Juan, our hosts for the next few days. Both of them are excellent equestrians and active endurance riders. They are the most wonderful and warm couple you could ever meet. They took very good care of us over the next few days and took us on a journey we will not soon forget. It was truly an equestrian adventure from the highlands to the beaches. The potential to create a real riding adventure here are endless – from breathtaking mountains, sink holes, remains of old historic haciendas and grandiose canyons to the jungles, lagoons, mangrove forests, wildlife and untouched beaches of the coast. 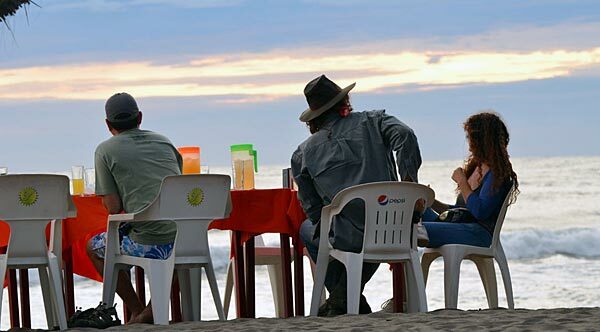 Overnights will be in historic haciendas, the community operated beach resort of Madresal (not accessible by vehicles) and a few days of camping at Lake Tolan and in the large canyons of the … river and its waterfalls. 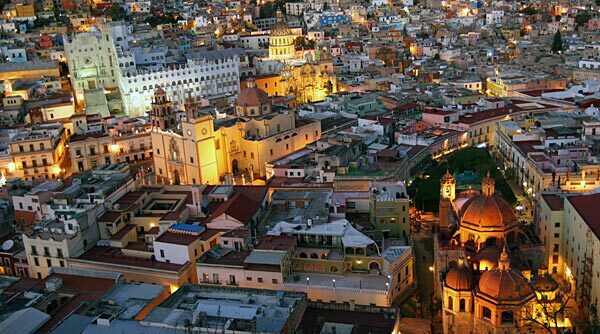 Of course we will also include a night at the UNESCO town of San Cristobal. Our group or riders (Ellen from New Mexico, Andres from Ecuador, Rachid from Lake Tahoe and with myself and wife Roberta) came from all over the world and not all of them were seasoned riders, but we still had an excellent ride with plenty of faster paced riding including some great gallops. In the hills it got quite technical, so I am sure this will be a trip designed for the more experienced and adventurous rider. At the coast the “beach resort” was far from luxurious (no electricity), but a magical place all the same. It is operated by the local community with 46 actual owner operators - and it showed in their enthusiasm to create the best stay you can hope for. Service is first class. 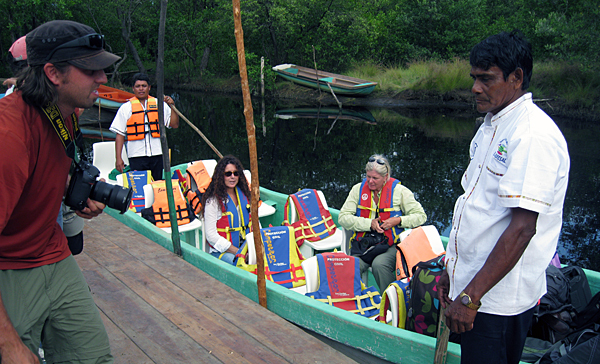 The place is not accessible by road, so we had to leave the cars behind, take a long boat (canoe type) through the mangrove trees, across a lagoon to the resort – always accompanied by helpful hands with luggage, camera cases etc. The cabins were simple, but nice and the highlight was the ‘restaurant’ right on the pristine sandy beach. Of course there were lots of fresh drinks and soon we all had a big freshly caught fish on our plates for dinner. Then the local people that are in charge of the turtle hatchery showed up just before dark with 1200 baby turtles in buckets …. We became part of releasing them into the wilds and into the ocean … what an experience. Could get any better than that ? Yes, it did. The next morning early around 7 am we all got into some canoes that were masterfully manoeuvered through the mangrove forest. Here we experienced thousands of birds including a nesting area with hundreds of baby birds, as well as short sightings of a few crocodiles right next to our canoes …. Pretty exciting stuff ! The trip ended with a transfer to San Cristobal. 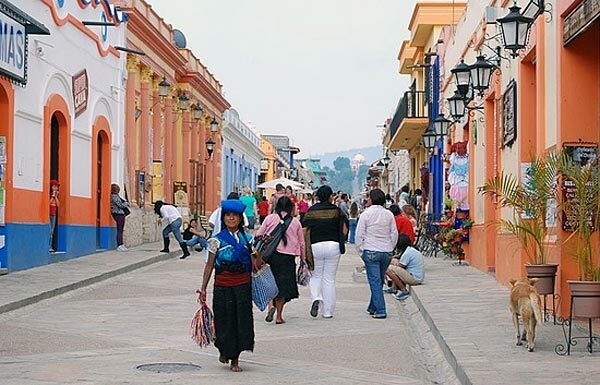 The city, especially the historic center, has maintained its Spanish colonial layout, with narrow cobblestone streets, roofs covered in red clay tile and wrought iron balconies with flowers. The facades of the buildings vary from Baroque to Neoclassical and Moorish, painted in various colors. In areas milk is still delivered from canisters on donkeys, with other donkeys hauling firewood. After having enjoyed many good Mexican dishes along our travels, my wife Roberta, a Sicilian, had a craving for Pizza. So we strolled around some of the traffic free streets that are full of little stores, crafts shops and restaurants – and found a very traditional Italian Pizza place …. So we are in the middle of southern Mexico and we have one of the best Pizzas in years … and believe me – if Roberta says it was a good Pizza .. you can bank on it . 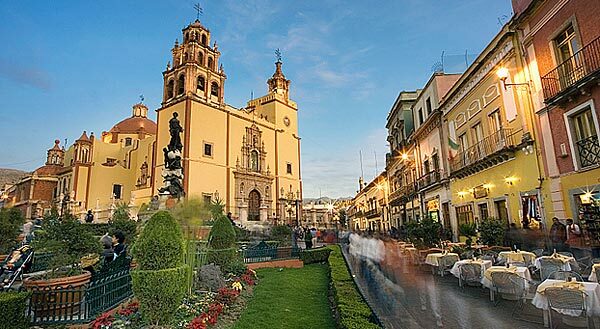 The atmosphere in this little historic town, that is part of the “Magical Towns” of Mexico, was just wonderful. It was relaxed, traditional and yet sophisticated. We enjoyed many good meals, some fun evenings and of course the Summit. Even President Calderon came to open up the Summit … When have you ever heard of a president of any country to come to open an Adventure Tourism Summit … anywhere !? I was really impressed by his speach and outlooks for his country. 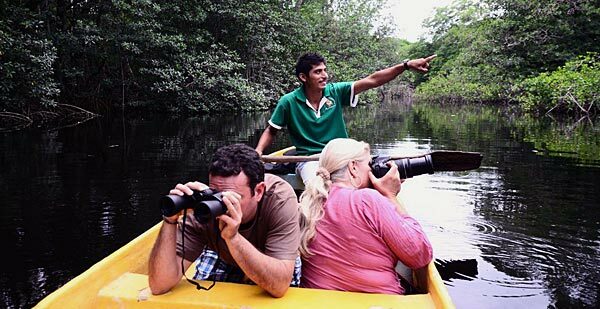 Seems he is on the right track to promote adventure travel, sustainability and environmental conservation for his country. Thank you Mr President. The Summit was a big success, a lot of fun and of course the time in Ciapas was much too short to see everything this state has to offer, so be assured we will be back to see and explore a state so rich of history, culture and nature. After the summit it was very difficult to leave San Cristobal … we really felt at home. But we had one more stop before going back home. It was the last, but certainly not the least important stop of our venture. We flew back to Mexico City where a driver from Rancho Mexicana picked us up and drove us to one of my favorite places. My family has spent several wonderful holidays at the ranch including an unforgettable Christmas. I don’t know what it was when I first came to the ranch, but immediately it felt like it was a part of me. We hadn’t been there for 4 years and it was amazing to see all the changes and improvements. When I first went to the ranch 10 years ago and sat down with Uschi, the owner, we looked over the valley and exchanged ideas about what would be the next improvements to tackle. Now I can say … everything is perfect – more beautifully decorated rooms, a small spa, wonderful pool area and hot tub … all surrounded by breathtaking views. Well done Uschi ! Uschi is one of my best business partners and I just love to work with her. I know she takes 100% care of my clients and it shows up in the incredible trip reports we get back. The ranch is one of the few places in the world where you can send very advanced riders and novice riders at the same and you know all of them will come back with an experience of a lifetime. A herd of over 30 well trained and extremely well taken care of horses, combined with 5 or 6 wranglers, offer riding for all levels in different riding groups. There are 2 hr rides with maybe a stop at the local store all the way up to rides of 8 or 9 hours that go across country and take all day. Now we can even offer progressive rides on a big circle tour (horse stay out at night and riders transfer back). I certainly had an excellent ride again with Uschi’s new helper, Jenny. Jenny actually first came to the ranch as a Hidden Trails guest, fell in love and stayed. That shows you the many roles we get to play as an equestrian holiday agency. Of course our trip had to come to an end and we sadly sad good-bye to Mexico and all of our friends and flew back to Vancouver … a wonderful trip had come to an end.